Cultural heritage objects are subject to the deposition of a multitude of airborne pollutants even when kept inside museums, archives, historical buildings or showcases. Some of the pollutants are quickly deposited onto any available surface, including the interior walls and CH objects themselves. This might make the compounds seem absent from analyses of indoor air samples. A new method of detecting water soluble pollutants without taking samples from the interior walls or from the CH objects themselves has been developed. The method involves sampling the pollutants accumulated on a surface near the CH object, e.g. a nearby wall or an interior glass surface of a showcase. The samples were obtained by gently flushing the surface with deionised water to collect the ions readily removed from the surface. The method was tested on a variety of surfaces. The flushed water were analysed with IC (Ion Chromatography) and ICP-MS (Inductively Coupled Plasma Mass Spectrometry) and included ions of Al, As, Ba, Ca, CH3COOH, Cl, Co, (COOH)2, Cr, Cu, F, Fe, K, Mg, Mn, Na, NH4, Ni, Pb, S, Sb, Si, Sn, Sr, Ti and Zn, and the ions NO3 −, PO4 3−, and SO4 2−. The resulting concentrations were converted to µEq, providing the ionic balance and the relative amounts of the ions and elements present. Ionic balance was observed on smooth and inert surfaces, but in some cases the chemistry of the wall contributed to the flush water. Solid samples of some of the surfaces have been analysed by XRF to clarify these more complex situations. Clear results appear from smooth or well defined surfaces, whereas more complex situations arise when the underlying surface itself contributes to the flush water. The method is working very well and is easy and cheap to implement by curators and conservators, who can the send the flush water to specialized laboratories. A new methodology capable of monitoring the accumulated airborne deposits on surfaces in showcases and historic buildings is presented and tested. The method is cheap and is easy to implement by curators and conservators and allows the assessment of threats to the CH objects which are not always observed by analyses of the indoor air. Cultural heritage objects in situ, on display or in storage are in constant danger of deteriorating due to aggressive chemical species in the indoor air. Caretakers face an array of specific needs and demands according to materials and environment in order to preserve the artefacts [1, 2]. As a consequence, the monitoring of various gasses and particulate matters in historical buildings, archives and museums has, in the recent decades developed into an industry and a research field of its own [3–6]. Long-term monitoring is now widely in use, and the species monitored are often decided upon when the presence of a specific pollutant has been observed . As the pollutants may come from the showcases, the building materials, the artefacts or from the outdoor air, knowledge about the inventory and fate of volatile components inside the showcases are important . Several methods for monitoring airborne pollutants have been devised and tested previously. Dosimetry as a method of determining air pollution threat was made available by Grøntoft et al. , under the MEMORI® system. This consists of two small dosimeter samples; one dosimeter is covered with a thin synthetic polymer film and sensitive to oxidizing gases such as nitrogen dioxide (NO2) and ozone (O3), and with UV light, while the other is a potassium-rich glass sensitive to acidic gases. 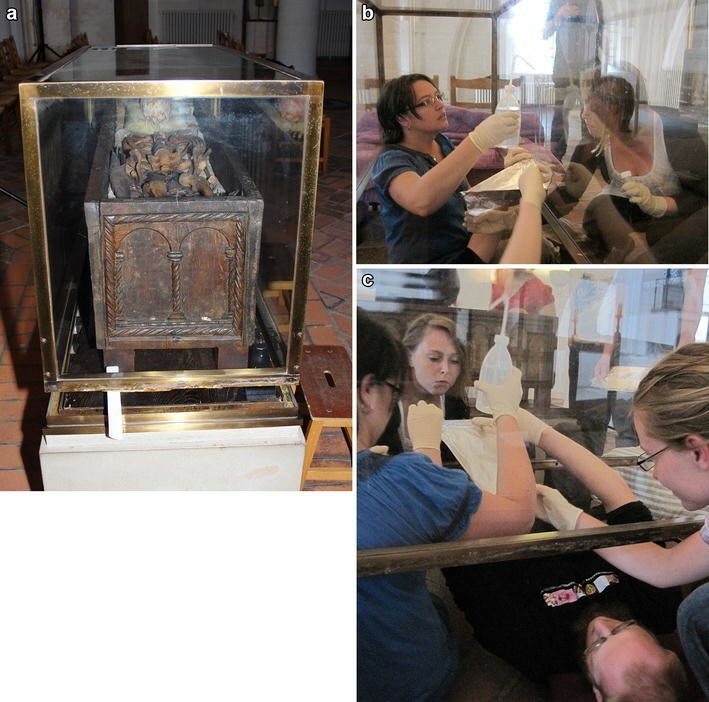 X-ray fluorescence has been used to monitor CH objects in the Czech Republic by Trojek et al. . This uses non-contact determination of elemental composition and has been able to increase the sensitivity and extended the range of lighter elements to be determined in the examination of artworks. Tempera dosimeters have been used as dosimeters by Odlyha et al. and can rank the sites and act as early warning devices or damage assessment tools. Automatic corrosion loggers have been developed Prosek et al. . Resin mastic varnish-coated piezoelectric dosimeters have been developed by Odlyha et al. [12, 13] for monitoring the indoor microclimate or in specific sites such as organ pipes and microclimate frames for paintings. EWO dosimeters have been developed by Lopez-Aparicio et al. . Glass Dosimeters have been developed by Leissner [15, 16]. Dosimetry has been developed by Grøntoft et al. in the special application to paintings in microclimate frames with early warning from a synthetic polymer and the Resin Mastic coated piezo electric quartz, however, they ran passive diffusion samplers alongside for individual gases. In the present study we report the results of testing a new rather simple pre-screening method for major polluting ions and compounds as well as the possibility of establishing a fingerprint that characterises the surfaces inside showcases and interior surfaces in large buildings. The surfaces we have studied encompass glass, steel, painted, lime-washed and concrete interiors. The purpose of this new method is to supply conservators and caretakers with easily accessible samples that give an indication of the need for further action in relation to climate, or monitoring of chemical species in or around the CH objects. The sampling method is easily applied using non-specialized equipment, so that conservators and curators can readily provide samples for an out-of-house analytical laboratory. As many pollutants are deposited on any available surface in contact with the indoor air, the aim is to collect the airborne and easily dissolved species; specifically not to take samples from a potentially fragile object, but rather the materials in the surroundings of the object subjected to the same influence of the indoor air as the object itself. This includes highly reactive species; which might be absent from a conventional air sample due to fast reaction rates . Furthermore this pre-screening method provides conservators with data enabling them to plan further actions or undertake a more thorough analysis. Four widely different types of locations in Denmark were selected for sampling the surfaces in order to assess the methodology. The first location was the interior surfaces of the glass showcase holding the remains of Saint King Canute the Holy of Denmark (died AD 1086), see Fig. 1. The showcase is situated in an open crypt in the Sankt Knuds Cathedral in Odense, and the bones of the saint are placed in the original wooden coffin from AD 1100 together with large amounts of textile making up the majority of the volume within the showcase [18, 19]. The showcase was constructed for the purpose in 1875 and like all nineteenth century showcases it is relatively air tight, although not completely, as will be discussed further below. Three different archive buildings were selected, all of which have been used for storage of written heritage materials. However, they were built at different times and therefore contain different kinds of construction materials and have different indoor air environments. The Nyrop Wing of the Danish State Archives at Jagtvej in Copenhagen, erected 1893, is the oldest building. 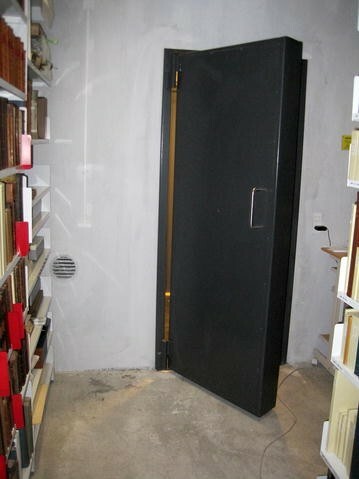 The end-panels of a series of red-painted bookcases in the archive were chosen as sampling sites at this location (Fig. 2). The second building was the Koppel-wing of the State Archives at Jagtvej constructed in the 1960s (Fig. 3). 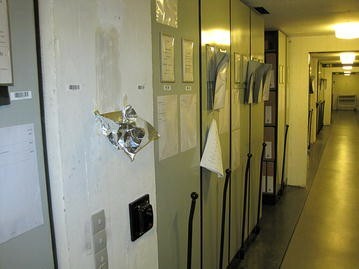 Two sampling sites were selected in the Koppel-wing both were painted white, but the underlying surfaces were a metal bookcase and a concrete wall, respectively. Both buildings have now been decommissioned and sold to a private owner. The third and most modern of the archival buildings is the one holding the Arnamagnaean Collection of rare medieval books in Copenhagen. It was constructed in 2008 and provides the opportunity to analyse the effects of contemporary construction materials (Fig. 4). A metal vault door painted dark grey and an aerated concrete wall painted in white silicate mineral paint were chosen as sampling sites. Finally, two medieval churches situated on the island of Funen in Denmark were selected. The churches are representative of the medieval churches in Denmark. The state of preservation of the churches and their interiors are typical for such buildings, which is a priority in managing the Danish cultural heritage. The churches represent two different stages of renovation. The lime wash of Nr. Broby Church was renewed in 2004 (Fig. 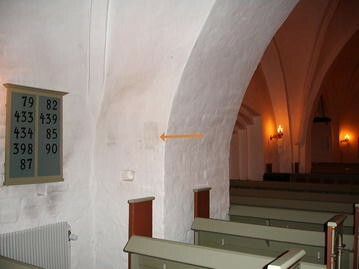 5), whereas the interior walls of Søndersø Church has not been treated since the late 1930s  (Fig. 6) and thus enables us to distinguish between short and long term pollution effects in medieval building interiors. Samples have been procured from vertical surfaces at all locations. The contribution from dust particles has thereby been minimized, leaving mainly the imprint of the gaseous environment and the contribution from the surface itself to be analysed. The dissolving medium used was deionised water, as the analyses were focused on the ions lightly attached to the surface. The water soluble ions present in the surface layer were retrieved by gently rinsing the surface with deionised water. The water was applied gently by a handheld pre-cleaned squeeze bottle, the water being flushed along the top of a rectangle. The water slowly ran down the rectangle and was collected in an in-house build funnel made of aluminium foil, which was held tight towards the wall. At the end of the funnel was held a small plastic bottle (25 mL) for collecting the flushed water (Fig. 7). A new funnel was used for each area. The folding of the funnels requires a certain minimum of origami skills especially as it is undertaken whilst using gloves. The size of the area was decided upon out of practical experience—it cannot be too small in order to handle in a precise way because the squeeze bottle has to have some distance from the wall. On the other hand, it is not practical to have an area bigger than one person can handle and hold the funnel tight to the wall. The areas used were 0.03–0.07 m2 in size, roughly the same area as an A4 paper format. The sampling site should be as close to the CH object as practically possible. However, this distance cannot be expressed in meters, but rather in terms of air exchange rates—the CH object should ideally be in the same confined air space as the object. If as an example the object is situated in a show case, then the ideal sampling site is on the interior glass walls of the show case, and not on the outer surfaces. The retrieved water, between 10 and 20 mL, was kept refrigerated until the samples were analysed on a Dionex DX-120 ion chromatograph (IC) with a Dionex AS3500 auto-sampler. The IC was equipped either with a Metrosep AS5 150/4.0 anion column and AG14 pre-column or a Metrosep C4 150/4.0 column for the cations. The flow on both columns was 1.2 mL min−1. The elute consisted of 3.5 mM Na2CO3 and 1 mM NaHCO3 for the anions, and for the cations were used 1.7 mM HNO3 and 0.7 mM dipicolinic acid. A certified multi-anion standard solution from FLUKA Analytical was used for the anions, and an in-house standard was mixed for the cations. The IC measurements were only repeated occasional for dilution checks, but always with consistent results. ICP-MS was applied for further analysis of the cations of the samples. The analyses were performed using a Bruker 820 ICP-MS equipped with a frequency matching RF-generator and a collision reaction interface (CRI) and an SPS3 auto-sampler. The analyses were done using an argon-flow of 15 mL min−1 and using a collision reaction interface with H2 and He as skimmer gases for selected elements. Certified standard solutions from FLUKA Analytical and Merck were used to quantify the analysed element. ICP-MS grade chemicals were used for dilution, carrier, and internal standardization. Five replicate analyses were made of each of the flush samples and each replicate consisted of 30 full scan spectra, which were averaged. Further details of the ICP-MS method are described elsewhere . The underlying surface of the samples from the Arnamagnaean Collection has been investigated by means of µ-XRF using a Bruker ARTAX-800 equipped with a molybdenum X-ray source, a polycapillary lens for focusing the beam spot of the X-ray radiation to 62 µm, and a Peltier cooled energy-dispersive detector. The surface material has been collected using a scalpel, and the resulting samples have been placed on a plastic plate to eliminate background fluorescence and analysed for 60 s live time. The resulting spectra have been processed using the Bruker software. The results have not been quantified using this technique. Air temperature and relative humidity at were recorded at all sites using compact climate loggers (by Onset HOBO, and Gemini Tinytag Data Loggers). These types of climate sensors typically have an accuracy of ±3% RH and ±0.5 °C. Inside the showcase and at the Arnamagnaean Collection’s archive the concentration of acetic and formic acid was monitored in the air using a commercial passive diffusion sampler provided by the Swedish Environmental Institute (IVL). Samplers were exposed in duplicate; the accuracy of the method is about ±25%. An overview of the analysis technique for each ion or element is given in Table 1. The concentrations of the ions in µEqs are listed in Table 2. In Fig. 8 is shown the anion inventory calculated as percentages of the sum of all anions, and in Fig. 9 is shown a similar plot for the cations. The ion balance has been calculated by subtracting the total amount of anions from the total amount of cations (all in µEqs, see Fig. 10). As such a positive balance indicates a lack of one or more anions, which may not have been analysed for in either of the applied methods, and vice versa for a negative ion balance. Analytical blanks were made at each location using the identical water and aluminium foil as was used for the sampling. Results of the blanks have been subtracted from the respective samples. For the showcase glass and archival walls, the major contributors of anions have been chloride, sulfate, acetate, and oxalate, and for a single sample phosphate; whereas sodium, ammonium, calcium, zinc, magnesium, potassium and strontium, and in a single case cobalt, represents the cations. In addition, nitrate, fluoride, lead, aluminium, copper, manganese, barium, iron, arsenic, nickel, chrome, antimony and tin have been detected among the minor contributors. The distribution is somewhat different for the lime washed interior walls of the two churches. Here chloride, nitrate, and for a single sample also sulfate, make up the major anionic components, whereas calcium, sodium, potassium, and manganese represent the major cations. Sulfate makes up for the rest of the anionic composition in all but two samples; one was from Nr. Broby Church where fluoride was detected, and the other was from Søndersø Church where sulfate was detected as the sole minor contributor. The minor cationic contributors in the churches were found to be magnesium, ammonium, zinc, strontium, aluminium, copper, lead, barium, antimony and arsenic. The ion balance was negative for the majority of the samples, leaving only the samples from the showcase and a painted concrete wall lacking an anion and thereby with a positive balance. The underlying surface material on the wall, door and floor of the Arnamagnaean Collection reveal the presence of calcium, lead, titanium, iron, barium, manganese, potassium, cupper and silica, with an addition of chloride and sulfur. The vault door painting had a large contribution from titanium, a smaller contribution from iron and lead and traces of calcium, strontium, zinc, chloride and sulfur. Analysis of the wall paint and concrete reveal major contributions from calcium, barium, chloride, lead and iron, whereas silicium, sulfur, potassium, manganese and zinc make up a minor portion of the inventory. The floor dust sample appears to echo the wall and door samples, as the sole major component is calcium and minor contributions can be detected for sulfur, chloride, potassium, titanium, manganese, iron, copper and lead. At the time of sampling the indoor climate at the two State Archive buildings was 20–22 °C and 35–40% RH, at the Arnamagnaean Collection is was 20 °C and 52% RH, and at the two churches it was 18–20 °C and 70–77% RH. The air quality inside the Sankt Knuds Cathedral showcase has been discussed in detail elsewhere , but the main findings are summarized in the discussion below. As can be seen in Table 2 the tested surfaces are quite different in their inventory of ions and elements. The major contributors to the surface chemistry are therefore easy to distinguish. A complete ionic balance has not been found for any of the samples, although some of them are quite close. However, in most cases where an anion is missing it is most likely carbonate, and in samples low in cations, it is most likely protons that are missing. Neither of these two ions were analysed for in the methods applied, and since they are ubiquitous in indoor air and on various surface materials [23–25], there is a high probability that they constitute the missing ions. In the samples from the interior glass wall of the showcase the total distribution is almost completely in ionic balance leaving only a small portion, which may very likely be made up by undetectable carbonate ions, as these would likely be present in the indoor air due to the lime washed interior walls of the cathedral. Furthermore, the contribution from the glass surface itself, being completely insoluble in water, can be set to zero leaving only contributions from gases and particles adhering to the surface. As the cathedral is situated in the town centre of Odense relatively near the coast a major contribution from sea spray is to be expected, and sodium chloride is indeed found in great quantities. The primary source of sulfate and the minor contributor nitrate is most likely due to the traffic passing close by the cathedral . The air exchange rate between the indoor air in the church and the air inside the showcase has been measured to 0.8 showcase volumes per day, which is normal for museum showcases . So, even though the effects of the traffic pollution are damped considerable first by the church and secondly by the showcase, there is still a measurable contribution. The other major source of anions is most likely the decaying oak of the eleventh century coffin also present inside the showcase  and the wooden plinth from 1875 on which the coffin is placed . The results of the analyses of the two samples from inside the showcase are therefore consistent with a mixed salty and organic acidic environment; to which the bones of King Canute the Holy are constantly exposed. This is in good agreement with prior measurements of the organic acid concentration in air inside the showcase, which revealed very high levels; 140 ppb formic acid and 1020 ppb acetic acid. The climate inside the showcase is almost constantly 19 °C and 60% RH year-round, which together with the acid vapour may cause severe material damage, e.g. corrosion of certain metals . 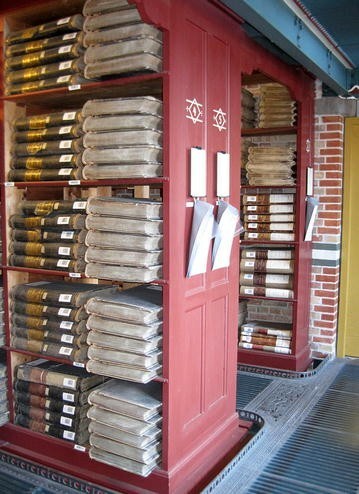 In the oldest of the archive buildings, the Nyrop Wing, the chief contributor is ammonium sulfate. This compound has been acknowledged as an indoor air pollutant [25, 28, 29] and it could be the accumulation of this pollutant through many years that we see in these samples. However, ammonium sulfate has previously also been used as a flame retardant  and for preserving wood along with various copper salts . It is possible and even likely that the bookcases in the archives could have been treated with this compound. The minor contributors indicate that aluminium could be a component of the red paint used for the bookcases, and the degradation products from the books and papers in the archives—acetic and oxalic acids [32, 33]—are also present in the samples. The ion balances for the Nyrop Wing samples are negative, which is consistent with the findings of the remains of the acidic compounds. The samples from the new wing of the archive, the Koppel Wing, can be easily distinguished from one another. The two samples from the painted metallic bookcases are almost identical in their compositions, whereas the sample procured from the concrete wall has its own characteristics. As zinc is one of the major contributors in the bookcase samples, it is highly likely that paint with zinc-white as a pigment has been used. The remains of ammonia particles may be evident, as there are major occurrences of ammonium, sulfate and nitrate. Degradation products as well as a fair amount of various metals characterize the samples from the bookcase along with an ionic balance close to zero, with the balance tipping in favour of missing protons. It seems that the degrading products are distributed differently, each component drawn to a certain surface. Therefore the concrete wall appears to have been the main target of the acetic acid leaving no other major anionic component in this sample, and besides there is evidence of a large amount of protons in this sample. The ion balance is the most profoundly negative of all the samples being at least five to six times more out of equilibrium than the nearest. The slightly basic concrete wall is probably acting as a reservoir for the acidic compounds in the room and there have apparently been a lot of them. A further investigation of the influence of the acidic environment on the stored artefacts could be interesting. The aerated concrete wall sample from the Arnamagnaean Collection may serve as a comparison to the 1960s wall in the Koppel wing of the State Archive. The differences between the two sites show which compounds are likely to adhere to a concrete surface. Acetic acid is abundant in both sites. Ammonia and nitrate are most likely deposited as particles . The presence of aluminium, iron and manganese on the older wall may originate from dust or soil deposited over the years. The large difference in the two ionic balances also indicates that the deposition of acid has accumulated gradually in the older archive building. The modern paint sample from the Arnamagnaean Collection vault door is clearly different from the rest of the samples. It is the only sample exhibiting phosphate as a major anion; strontium and zinc are among the major cations. It is also distinct in having no minor cationic contributors. Only a few polluting agents seem to be deposited on the smooth surface, as is evident from the lack in minor cations and an ion balance which is close to zero. For this site the underlying surface has been investigated, and the indication of use of titanium and lead in the paint is quite clear. The fact that the same contributors are found in the flushed water as well as on the underlying surface is further evidence of the lack of polluting agents on the vault door indicating a very clean indoor air environment. This is in line with the concentration of formic and acetic acid in the air of the archive, which was measured to <3 ppb total (one month average). The results of analyses from the two churches indicate that ammonium nitrate particles were ubiquitous in the indoor air of the churches . The interpretation of Skytte et al. was that ammonium nitrate particles break down upon entry inside the church releasing ammonia and nitric acid. It is apparent from the ionic balance (see Fig. 10; Table 2) that the remains of the acid can be detected in the samples. When the data from the two churches are compared, it is evident that an accumulation takes place over time. Nr. Broby Church is relatively close to ionic balance, which it owes to the newly applied lime wash, whereas Søndersø Church shows evidence of a much larger amount of protons on the surface accumulated over the years since its restoration and lime wash in the 1930s. Evidence of gypsum and sodium chloride is also seen in the analysis. Here the sodium chloride will most likely originate from the upheaval and capillary transport of groundwater through the old walls resulting in crystallization of salt on the surfaces. 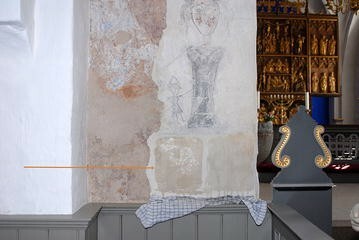 The walls of the churches represent huge buffers able to cope with the acidic environment, but artefacts with lesser acidic tolerance, like metals and certain pigments, might benefit from more frequent cleaning. Samples from more churches are needed in order to assess the problem of salt effluence in the walls, but this method might in the future help to establish cause of action regarding friendly heating or other indoor environmental actions for the churches. For surfaces of chemically homogeneous material, such as the glass walls of showcases and the lime washed walls of the churches, identification of the major polluting agents is relatively straight forward. The results from the flushing give a clear indication of which ions and elements are deposited onto the walls from the indoor air. A more complicated situation exists for the archives, where some of the underlying material seems to contribute to the flush-samples. A solid sample of the underlying material may help clarify the magnitude of this contribution and help assign sources for the ions and elements detected. As material easily abraded from the underlying surfaces may also end up near or on the cultural artefacts as a part of dust or micro particles, this risk from the building materials may also be evaluated. How dangerous are then the detected airborne pollutants for the CH objects? Generally, the worst effects must be anticipated for the metallic objects, where acidic species and salts may cause corrosion. Even very small corrosion attacks will be visible on a polished metal surface and the attacks are often irreversible. Seemingly non-reactive constituents, like e.g. K, may be part of hygroscopic salts, which may be harmful. Another potential danger may stem from Fe, Cu or Mn, which under certain conditions may be catalysts for SO2 oxidation. Paintings and painted surfaces are conceivably also susceptible to chemical reactions with acids and salts, although the effects are generally limited by the binder in surficial paint layer. For paintings, the deposition of particles can constitute a serious problem potentially subduing or even changing the colours, and the deposition of gaseous species may form a film which makes cleaning of the painting more complicated. Murals are more robust and a simple calculation using a yearly ammonia deposition on walls of 300 μmol m−2 , which when converted to nitric acid reacts with 0.03 g (CaCO3) m−2. This layer of calcium carbonate (density 2.7 g cm−3) which is removed, add up to only a micron thick layer each century. The same will apply to human bones, as in the case of the bones of King Canute the Holy. A fourth type of object is textiles, where the deposition of acids and salts may cause accelerated degradation over time. It should, however, be noticed that there can be many special combinations of a CH object and the deposition ionic inventory which are not covered by the examples given. It is recommended to contemplate the combination of object and deposition in each particular case. A major advantage of the present methodology is that the determinations are quantitative and that ionic balance is more or less obtained. One consequence thereof is that there is no need for the CH objects to be exposed through the same time interval as the flushed surface—the effects are cumulative. An example of this was illustrated by the pH-measurements of a communion table in Nr. Broby Church , where the communion table was cleaned weekly but still within a week accumulated measureable acidic airborne compounds. It is suggested to utilize future opportunities when CH objects are under conservational treatment to extract—if possible—samples of water dissolvable ions, and compare the analyses of these with results obtained by the present method on nearby surfaces. How does the methodology presented here fit in with the previously established methods? It provides information on soluble often non-volatile species; both those deposited onto the surface, but also the reaction products. The non-volatile species and sometimes the reaction products determined in the present methodology are complementary to the use of passive diffusion samplers. It is specific, quantitative and determines both anions and cations, which distinguishes it from several other methods that determine a surrogate of the environmental impact, such as damage via dosimetry which is not always specific and quantitative. X-ray fluorescence can give only an elemental analysis, i.e. lacking most of the anions, which can make it hard to interpret. Additionally XRF analyses penetrate several µm into the surface yielding a chemical signal to an indeterminate section of the sample below the surface. Gaseous pollutants and airborne particles deposited from the indoor air onto interior wall surfaces have been determined in various buildings storing cultural heritage objects using a simple methodology developed in this work; where the deposited pollutants on nearby surface were investigated by flushing gently with deionised water. The method has been tested on a variety of types of surfaces. These constitute only examples of the application of the method. However, it is believed that the method has the potential to be generalizable. Samples from smooth or well defined underlying wall materials provide clear indications of deposited airborne pollutants, whereas results are less clear where the underlying material also contributes to the composition of the flushing water. However, the results—regardless of surface—show that it is possible to assess the contributions from major pollutants in the indoor environment. Whether the pollution originates mainly from an outside source, or it is derived from indoor sources, or even from the object itself, can in most cases be ascertained by the method. The method is therefore a useful tool in assessing the immediate environment to which the cultural heritage objects are exposed without sampling the objects themselves. LS, BS, MRS and KLR performed various parts of the chemistry. KLR and PB drafted the manuscript. All authors read and approved the final manuscript. Pia Klingenberg Haussmann is thanked for technical support.